Buddha Purnima is the most important festival of all Buddhist groups. This day celebrates not only as the birthday of the great Shakyamuni, but also the anniversary of his enlightenment and the anniversary of entering the parinirvana, meaning the leaving of body. Buddha’s birthday festival in Kathmandu lasted two days from 29 to 30 April. It started for us with a grandly celebrated – at home in opposite – anniversary of the death of our householder’s mother-in-law’s sister. The mother-in-law in the Vedic culture countries – including the Tamang society – enjoys the same respect as the own mother … if not more as the she is the one who gave birth to her/his beloved one. A year after someone’s death, it is believed that a person has already found his/her next incarnation, or any place in the universe, and therefore this time is a time of joy that should be shared with other family members in our world. That’s why there was a lot of laughter and music in the house opposite, and at first we thought it was already the Buddha Jayanti. The festival, however, began the next day. Interestingly – it coincided with another regional family event. 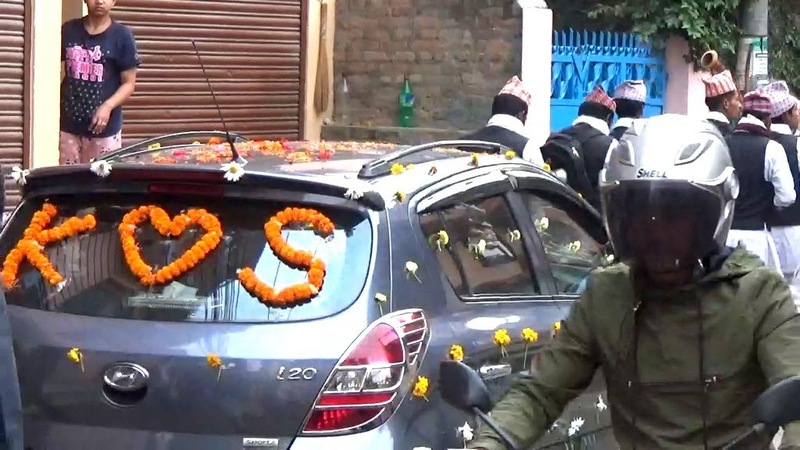 Friends of our Brahmin friends – a family from the Newari caste – were celebrating the wedding, which was marked by loud live music heard throughout the whole morning. In the early afternoon, the streets of our region were filled by a wedding parade made up of an orchestra, a wedding car, and a small procession of wedding guests, and after riders on scooters. At 8:30 pm, the wedding parade returned in style, which – as it is often the case in the whole world – is even more loud in the evening. In the meantime, the Buddhist part of the community was already preparing for the celebration of the holiday, which was to take place on April 30. That day was the full moon, which in the Tibetan and Nepali calendars is called Purnima and is an important day for many religious holidays of Vedic culture. The full moon in the month of Baishakh is also a determinant when in a given year is to celebrate Buddha’s birthday, that is, Buddha Purnima. The Buddhist community had already cleaned up their homes and their surroundings in front of the houses, baked delicacies – mainly Tibetan khapsey – and in many houses were made ritual pujas that heralded the biggest Buddhist festival. The day before, with mom, we visited one of the nearby monasteries – Nehnang Pawo Monastery in the tradition of the Kagyu school. There, a dozen of young monks, a few teenagers and one senior lama were making the pre-celebration puja. In the ritual room – the floor below our apartment – our host made – on the first day of the happening -a puja for Tara. Six monks came from a nearby Nyingma monastery and a few lay people. Throughout the day – with a few small breaks for Tibetan chay – our house was shaken by the sounds of the Tibetan trumpets and drums. 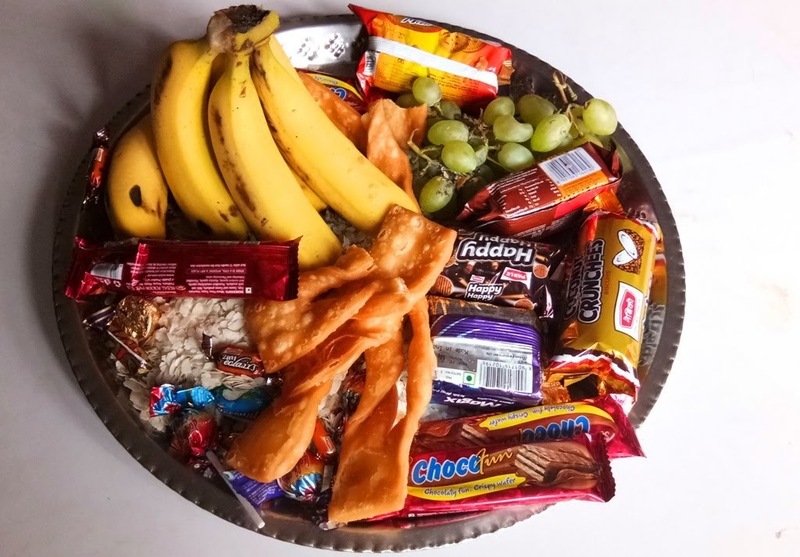 About five in the afternoon – after finishing the rituals – our lama (host’s name) brought us prasad – a tray with Nepalese sweets, on which where various delicacies and of course Tibetan khapsey cookies. At the passage around the Stupa, festival tents were set up – as a month earlier, during the Timal Jatra – and the whole area was hung with marigold flowers. Here and there were groups of giggling teenagers waving Buddhist banners as part of school actions. There was quiet music floating over above. In tents you could sit down, get information, in one of them there was a festival donation of blood. Rituals were only made here and there and were not publicly feasted, as a month ago, during the Timal Jatra. From the information on the posters we learned about the celebrated on the occasion of Jayanti – probably earlier in the day – the puja for world peace. Crowds swirled around the Stupa, at the entrance to Stupa, and at several juice distribution points. 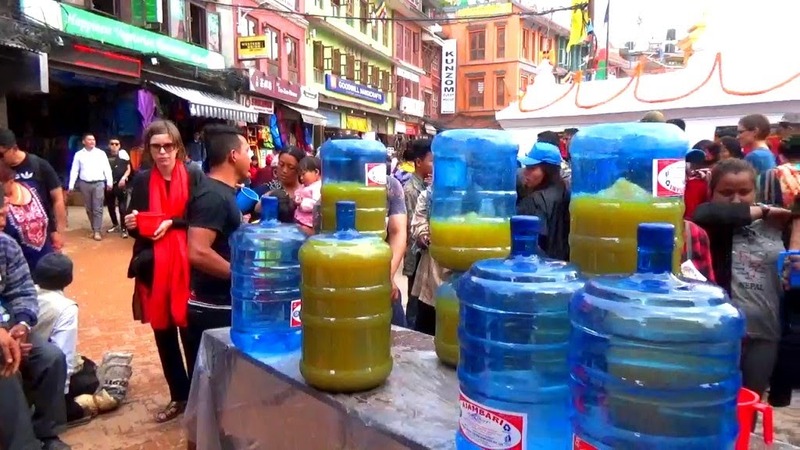 On the occasion, the Tamangs, organizing the entire public event, sponsored passers-by hectoliters of orange juice distributed from large water bottles placed in several places. We made one round around the Stupa and a round in local stores. On the way back we came by another private party – a Tibetan wedding. It took place in the regional center of Tibetan medicine. Then we came across the Tok Chek Ling Nunnery – known to us from the online search of the nuns of the Kagyu school of Mahayana Buddhism (nunnery – a monastery for women) – where the celebration puja was coming to an end. We only managed to see the interior of the gompa and a group of guests from the East leaving the place.